Throwback pictures have become a popular feature on the timeline of our biggest stars. From childhood snaps to fun memories of the past, celebrities are finding all sorts of blasts from the past and sharing the cherished and often funny moments online. 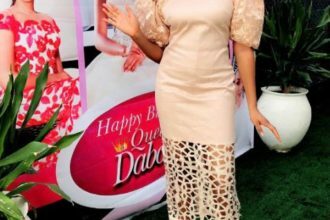 Recently, former beauty queen, Dabota Lawson joined the growing list of celebrities sharing adorable glimpses into an awkward phase of their past, when she shared a 90s picture that got everyone talking. If you fast forward to 2015, you can say, the adorable beauty has done so much for herself since emerging Miss Nigeria United Kingdom five years ago to becoming a beauty entrepreneur.